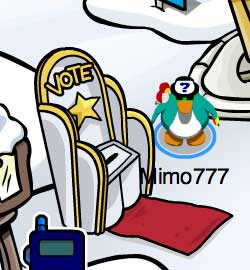 Club Penguin Cheats by Mimo777 Club Penguin Cheats by Mimo777: Club Penguin Play Awards Votes are In! I'm Shocked! They probabley changed it cuz everyone voted for underwater adventure. I'm shocked, too! :O I voted for Ruby And The Ruby. Golden Puffle Play is great! But I think we need a different winner this time. Remember, Golden Puffle won the awards last year, too! I was surprised too mimo! I voted for most of them The Underwater Adventure which i thought was better than the Quest for the Golden Puffle. I didnt like The Golden Puffle Play. i was honestly, really surprised. ugh, i hate the golden puffle play! people liked it i think becuz it was creative, and you had to leave the stage. but really, i mean i won last year too? and i think the music is loud and obnoxious, and the costumes arent amazing, either! Underwater Adventure won best costume too! I'm not shock, but I wish that ruby and the ruby won best play cause well I like that play the best. Too tell you the truth it was the first play I ever saw (long story short, stop playing Club penguin for awhile, started after the stage appeared). I Really like ruby and the ruby, I wish it won somthing. I really hate the quest for the golden puffle, I don;t know why but i just hate that play. I wish ruby and the ruby won. I LOVED Shadow Guy&Gamma Gal vs. Squidzoid. Personally, I was shocked, too. I am shocked! I didn't vote for the Golden Puffle at all. I can't believe that most people voted for The Golden Puffle! It won last year as well. They should let the other plays have a go at being the winner. IM so surprised! I dont agree with the votes!!! OH NO I forgot to vote! I voted for Underwater Adventure too! But I guess more people voted for The Golden Puffle. Actually, Mimo the voting booth is on the left not the right! I agree with the best costume winner, but I voted Ruby and the Ruby on everything else. So... I'm sad. But that's okay. Whatever. Loti. I am really happy that Golden Puffle won so many awards because it has costumes and themes inspired by ancient Egypt, which is one of my favorite periods in history! That's so not fair!!! It won everything last year! They need to take the play off. It's not even the best play! It's horrible!!! Yes, that's right H-O-R-R-I-B-L-E!! to be honest.. my favorite play of all time was the ruby one. I was surprised because i didn't think golden puffle was all that fun.. I was so surprised! 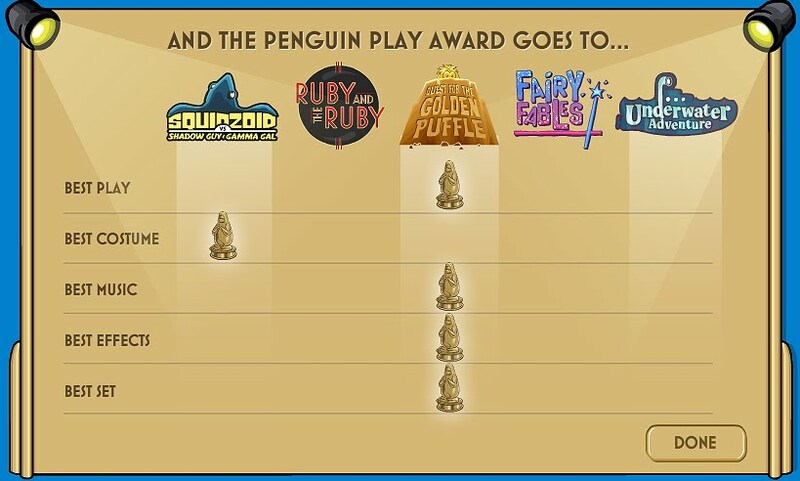 I honestly thought Quest for the Golden Puffle was going to not win Best Play! Also, Quest for the Golden Puffle won last year too! I know right?! Ruby and the ruby all the way! I loved Ruby and the Ruby!!! + the costumes are so bland!! I think quest for the golden puffle should be banned cause it won everything two years in a row. I am so super shocked! I voted for Ruby and the Ruby for all of them :0. I knew Ruby and the Ruby would not win all awards, but they won NONE!?!? Waddle on Mimo lovers! MIMO my prediction was just right! I voted EXCACTLY the same, no kidding or LIES!!!!! I am amazed by my skills. Anyway, all the other plays are nothing comparable to the almighty Quest for the Golden Puffle - the egyptian music and the thrills of plundering in a pyramid are the factors which make it the most succesful play this year. I am very very happy golden puffle won!! Egpytian culture and history is one of the most amazing and interstnig period of time. It is very insipiring and the culture is extremely fantastic. I just can't describe it enough! I voted underwater adventure!! I don't even like Quest for the Golden Puffle! And it won last year! I'm not really shocked. I think people are just voting for it for the Golden Puffle to be released. People are getting stressed out saying it's not fair on the others. But they were all made by the same people so nobody cares! I only know one person with penguin who didn't vote for the ruby and the ruby in almost everything! A few comments say that they didn't see the underwater adventure, is it just me or has it not been shown at all? I'm getting really bored of the golden puffle, I didn't even enjoy it much the first time it came out! I also love Ancient Egypt, and have idolised it in past years, but the golden puffle never helped my love for history or Egypt. Fairy Fables gave me more conviction in Cinderella! Anyway, it focused on the explorers and the setting, not the historical discoveries. I think they changed the votes because the wanted the same play to win again. It will probably win again next year. I love Ruby and the Ruby. It was my very first play. It was meh non days too. :( Im upset. I hate Golden Puffle. It's so stuipid and the music is obnoxious. I hate this play!!!! Either we liked this or this voting is rigged. IT'S THE EXACT SAME AS LAST YEAR! You must be crazy!!!! I sure did NOT vote for under water adventure. I voted for everything else! I voted ONE thing for the Golden Puffle... Thats it! Im sooo surprised! Hey you have to be nice here so please be nice, anyway it seems like the voting was rig cause well some many people here said they wanted they wanted another play to win. I was really surprised! I personally thought that Ruby and the Ruby had a WAY better set and effects. Darn it! Out of all the weeks, I've never met Aunt Artic or Cadace. I thought I met Aunt Artic but she wasn't shown on the "Users in Roon list" So it was just an imposter of her. I mad now. not shocked because i voted for them and they won! Well it's a great play, but I do think they should put other plays in the awards instead. I don't think they should "ban" the play, but I do agree that they should give other plays a chance. Actually it's a little different. This year Squidzoid won best costume instead of Fairy Fables. Actually i am kinda surprized!! I knew it would win... but not by that much!! What? I am really suprised now. I didn't vote for Quest for The Golden Puffle and I think not a lot of people did. I voted mainly for Ruby and The Ruby and Squidzoid Vs Shadow Guy and Gamma Gal because they ROCK. Quest for the Golden puffle doesn't though. Its just my opinion though. Yep, totally. I agree. Please can no one argue with me because its my own opinion. 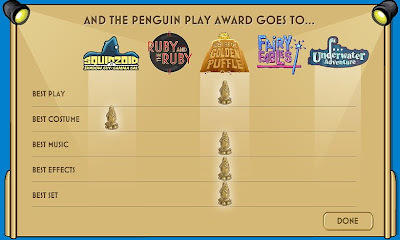 i like quest of the golden puffle, and i guess if it won 2 years in a row it just means its a popular play thats all. I voted for it both this year and last year, cuz i think its a great play. Honestly, I'm really surprised. I didn't like golden puffle that much. I mean the effects were OKAY but I think they've done better.